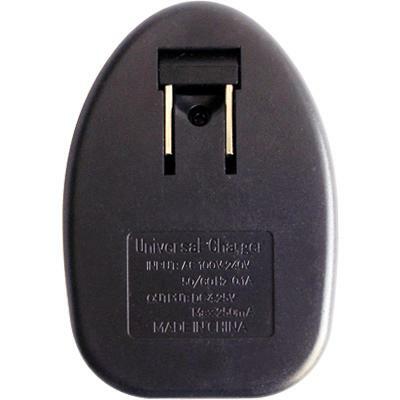 Universal battery charger charges cell phone, PDA and digital camera batteries regardless of size, capacity and shape. One charger can charge different cell phone, PDA or camera batteries at home, office or when travelling. Adjustable positive and negative contacts accommodates various batteries. 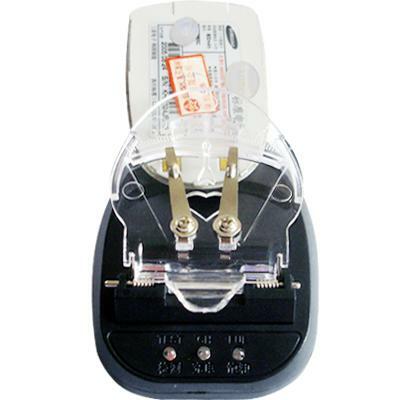 Universal Battery Charger allows you to test the positive/negative connection before you begin charging. Also, no power is applied to the battery if the polarity (positive/negative) is reversed to prevent short-circuiting the battery. Spring-hinge clip holds battery in place while it is being charged. Advanced CMOS microcontroller chip manages the charging process for safe, rapid and reliable battery charging. Suitable for any cell phone, PDA, PDA cell phone and digital camera batteries. *Before plugging in the charger, align the metal pins on the universal cell phone battery charger with the metal contacts on your battery. *Note: For batteries with more than 2 metal contacts, start by adjusting the charger pins to the furthest left and right contacts. *After inserting battery into spring clip, additional adjustments may be needed for proper contact alignment. *Note: Positive and negative contact does not matter at this point. *"CH" indicates battery is charging. *"FUL" indicates battery is fully charged.